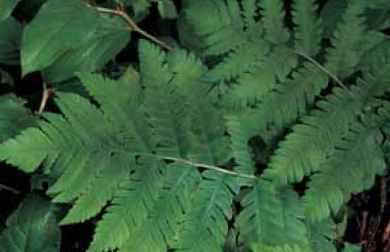 Synonym Dryopteris labordei var. indusiata Epithet means "possessing indusium." Evergreen, 2 ft. (60 cm).Zones 6 to 9. Apogamous. description: The rhizome is erect and the fronds are one-half stipe with a triangular bipinnate blade growing on a horizontal plane. The lowest of 12 to 18 pairs of pinnae point forward like swallow's tails. Sori are medial and covered by a kidney-shaped indusium. Dryopteris goldiana with its abruptly contracted frond apices. 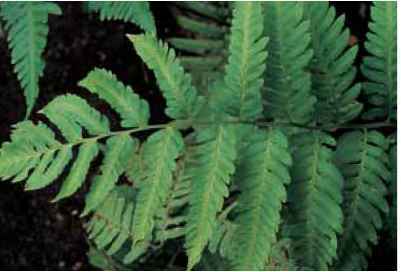 range and habitat: This fern grows in forests in the warm regions of Japan and Taiwan. culture and comments: With bright polished apple-green foliage this adaptable species offers highlights in dusky, dark communities. It adjusts in lean soils and shines even with minimal watering and benign neglect.